You never have to worry about missing cables from the usb-c super drive.It connects the MacBook Pro to the retina display, which has a cable built into the super drive. With this portable external CD DVD drive, recorder, writer, you can enjoy movies, music, CDS, etc.High quality DVD drive has excellent performance and long service life. Do not drive a drive near any magnetic object. If you are using a desktop, connect the device to the USB port on the motherboard for normal use. 1 x USB - C super external drive. 1 x USB Type c(Female) to USB(Male) converter. 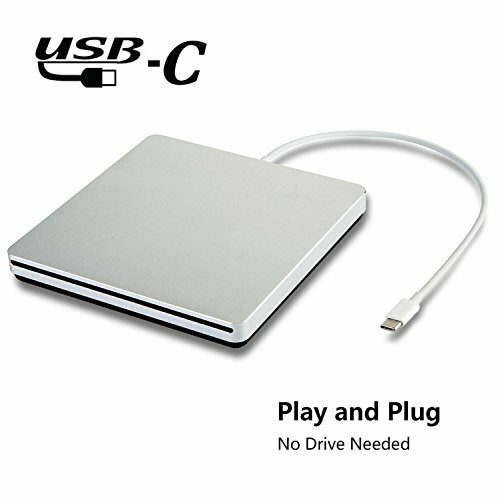 【Wide compatibility】：The external drive Compatible with Windows xp / 2003 / Wind8 / Vista 7, Linux, Mac OS system 10, NOT Compatible with who version than OS X Yosemite。Use for the latest MacBook Pro/MacBook which has USB Type C. Every item we provide a USB Type c(Female) to USB(Male) converter,so once you want to use for the USB port Macbook Air/Pro or other Notebook,you can use smoothly with it. 【Brand new design】：High speed intelligent combustion technology, with strong error-correcting capability, anti-impact and noise reduction technology, low power consumption and other characteristics. 【Plug And Play】：You don't need to install software to set up the driver, you don't need an extra power adapter, you just connect it to your computer's type-c or USB port, and it will run automatically. 【Matters Need Attention】：The type-c superdrive is not compatible with the iPad.The iPad doesn't have a driver.It also won't work with android tablets, which won't be able to provide enough power to run it.